There was no cucumber this morning! First the grass disappears, then the cucumber disappears. What’s gonna happen next? We’ve been running around on hard brown grass for the weeks now. It’s even browner than in those pictures. I don’t mind that much. There’s a tiny weeny piece of grass that appears just outside our run, and Mam moves the last panel slightly so we can get at it. I always share what’s left with Neville. I have to test it first. 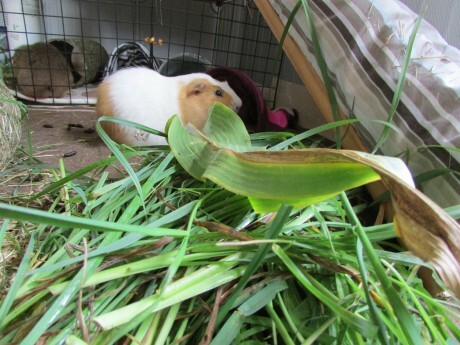 Mam gives us readigrass when we go in, which is nice. Mam says she’s making it rain just a little on our grass when we’ve gone inside in the evening. She usually makes it rain on the vegetables and some of the flowers, and even one of the trees when we’re still out. We’re staying in that area because it’s nice and shady, and the rest of the grass is even browner. It’s not going to rain anytime soon. I saw the weather forecast this morning. When we did NOT have cucumber with our cuddles. (She said there were none in the store when she went to get some more). We did have parsley instead. But it’s just not the ticket, Mam. I’ve noticed. I don’t know what Mummy is doing in the evenings, but she seems to be getting later giving us our cucumber. A month ago we got it when it was still light, and now when she gives it to us it’s almost completely dark outside. We complain, but she tells us “It’s not time yet,” and I’m sure it is. It’s also getting cooler when we’re out on the grass and the sun sets behind the trees. A while ago it was still warm enough to be out, and Mummy would give us our cucumber almost as soon as we’d come inside again. Now it gets a bit cooler, Mummy decides it’s time to come in (and I’m sure we haven’t been out for long – not if she’s been out playing golf, anyway), and then it’s ages till cucumber time. She says it’s due to it being September, and winter draws on. I’m not sure what that means, but it sounds okay. Then she says thing like “It’s less than three weeks to the autumn equinox.” Well, I’ve heard of that. Equi-nox means equal night. And Fred wrote an explanation of equal day and night time. I read it some time ago, and if you wonder what it means, you should read it too. I see Dylan wrote something on the Autumn Equinox too. You see, all the interesting topics have been said by someone else. What is a reporting pig supposed to do? 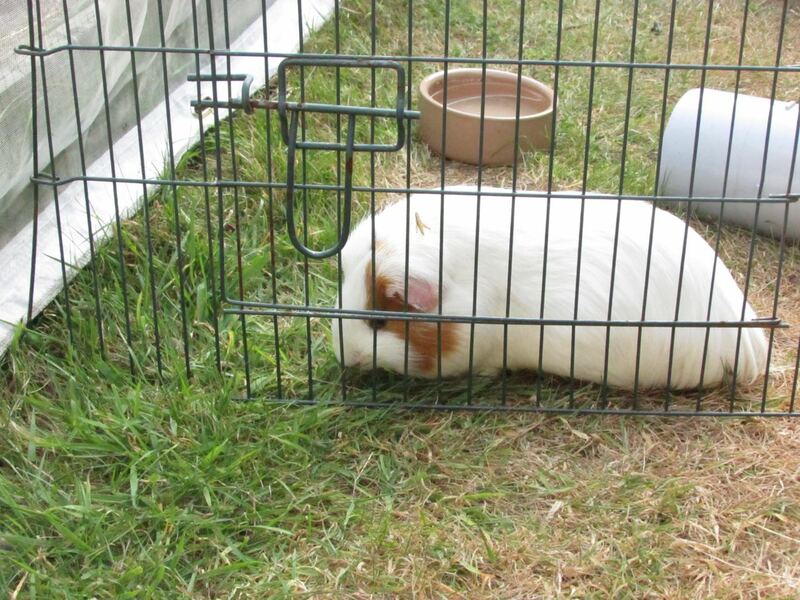 Give you some more photos of adorable guinea pigs, I suppose. I think I suggested when we did C for Cuddles that cucumber was even more of a favourite thing. We get little bits of cucumber at cuddle time in the morning, but in the evening, Mummy comes into the kitchen to make herself a drink and cut a slice of cucumber for each of us. Oscar and I live in the kitchen, so we lean over the side and watch her to make sure she gives us the best bits. Apparently Hugo and Hector used to do that as well, although most of us come to the side of the cage to get it straight from her hand. Bertie & Biggles only arrived two weeks ago but they’ve already become brave enough to take their cucumber from Mummy’s hand. Mummy’s very pleased with them. Is that cucumber ready yet? Come and see what F stands for tomorrow! It’s hard work this blogging business. Sometimes I have nothing to say at all. Mummy gets tips on what to do to keep your blog interesting. Let me see…. make some lists – your Top Ten somethings.